Since 2006, Natural Resources Canada (NRCan) has been consulting with key Canadian buildings sector stakeholders to respond to the need to develop a national building energy benchmarking tool. In 2009, as a part of this consultation process, the federal/provincial Council of Energy Ministers, now the Energy and Mines Ministers' Conference, endorsed the concept of a building benchmarking tool for Canada. For more information, consult the report: Building Energy Benchmarking: Recommendation and Work Outline for a System for Canada [PDF – 176 KB]. A 2011 NRCan studyFootnote 1 revealed that only 38% of respondents practice energy benchmarking. And of the respondents who indicated that they benchmarked their energy consumption, only 11% used this information for energy management investment decisions. A tremendous opportunity exists for the Canadian buildings sector to change this trend in a positive way by using energy benchmarking to take full advantage of all the benefits it has to offer. In the fall of 2011, as part of the U.S. - Canada Clean Energy Dialogue, Natural Resources Canada and the U.S. Environmental Protection Agency (EPA) signed an agreement to adapt the ENERGY STAR Portfolio Manager tool for Canada. For more information, see the news release: Governments of Canada and United States Harmonize Approach to Save Energy in Commercial Buildings. Read on to learn about ENERGY STAR Portfolio Manager, why it was chosen for Canada, and how Canada and the U.S. keep your Portfolio Manager data safe. ENERGY STAR Portfolio Manager is the U.S. EPA’s interactive energy management tool that is free to use and allows you to track and assess energy and water consumption across your entire portfolio of buildings in a secure online environment. It offers weather-normalized energy use intensity values, greenhouse gas emission metrics, reporting features that help you track trends over time, and 1-100 energy performance scores for eligible building types. Whether you own, manage, or hold properties for investment, Portfolio Manager can help you set investment priorities, identify under-performing buildings, verify efficiency improvements, facilitate accreditation in Canadian green building programs, and more. For the first time ever, Canada has a nationally standard energy benchmarking system based on actual Canadian data that provides accurate and equitable energy assessments for the commercial and institutional buildings sector. Natural Resources Canada regularly features energy efficiency success stories in our Heads Up: Building Energy Efficiency newsletter as well as on our Canadian Circle of Champions page. Working together, we can advance Canada's energy benchmarking movement for the commercial and institutional buildings sector and make a positive contribution to the environment. We would love to celebrate your energy benchmarking and best practice success. To share your story with us, email info.services@nrcan-rncan.gc.ca. A nation-wide system makes it easier for green building certification programs and other energy efficiency initiatives to collect standardized information and assess buildings consistently. A system that reflects the Canadian climate and energy production methods provides more realistic assessments of Canadian building performance. A standard system provides regional and national governments with aggregate trend data that can facilitate appropriate program and policy development. The following list outlines some of the reasons why Portfolio Manager was chosen as the ideal standard benchmarking system for Canada. Is compatible with other energy benchmarking programs and routines. If you’re already benchmarking using another system, you can still benefit from the standard national data and comparisons offered by Portfolio Manager. Already enjoys widespread use. It is considered the de facto standard for building energy benchmarking in the U.S. and by a large number of U.S. industry stakeholders. An increasing number of Canadian stakeholders have also endorsed the tool, and thousands of buildings in Canada are using it to benchmark energy use. Is easy to use. All you need to get started is basic energy consumption and building data. Is absolutely free to use. Is easy to access. Portfolio Manager is a web-based application, meaning that it does not require the purchase or installation of any dedicated software, works with any operating system, and is available through your web browser from any location with internet access. Applies to a wide array of building types. All types of commercial and institutional buildings - not just those that are best in class – can use Portfolio Manager to track energy use over time. Currently six types of buildings in Canada can receive Canadian-specific 1-100 ENERGY STAR scores, but more than 80 other types of buildings can also benchmark against national energy use intensity values. New Canadian scores for other building types will be added on a progressive basis. Is useful for both existing buildings and design projects thanks to the U.S. EPA’s Target Finder calculator. Uses actual data. Portfolio Manager's methodology uses actual building energy data derived from the Survey of Commercial and Institutional Energy Use, which is updated periodically, rather than a static model. Facilitates cross-border comparisons for organizations with holdings in both Canada and the United States. Energy benchmarking with Portfolio Manager is the first step toward managing and reducing your energy consumption. But don’t take it from us — watch our video (7:54) and let key building sector stakeholders tell you why they use Portfolio Manager to support their energy benchmarking needs and how it can help your business too! The issue today is that people do not want to keep using the same old methods of discovering energy efficiencies, the old ways of doing energy efficiency projects. Why does benchmarking play a role? When we are benchmarking our buildings, we can understand where we are and how we compare to our peers in the market. I find that there is a revolution currently taking place in building design. And more and more we have to get rid of the old construction and architectural project paradigms. Commercial and institutional building owners and operators are under more pressure than ever to improve the energy performance of their buildings and to establish and maintain accurate green asset value. As energy prices rise, as public awareness of the relationship between energy and the environment grows, as government interest and stakeholder knowledge increase, the need to increase efficiency, maintain accurate data, and keep costs down require more focus than ever on energy performance. Fortunately, this is an area where the buildings sector can make a valuable contribution. Today, energy benchmarking is an essential best practice for achieving greater energy efficiency, more accountability and control. It creates a clear path to saving energy, improving performance, and reducing greenhouse gas emissions, as you work with comparative, peer to peer, all Canadian data. We’re Natural Resources Canada, and we’d like to introduce you to ENERGY STAR Portfolio Manager. Adapted for Canadian use and conditions from the U.S. Environmental Protection Agency’s highly successful program, this tool can help you maximize building performance through a flexible system that covers more than eighty building types covering commercial office space, institutions, like schools and hospitals, and much more. It can help you complement your existing energy benchmarking routines, too, becoming a key tool in any building manager’s toolkit. Listen, as your colleagues talk about this all-Canadian benchmarking program. The key drivers for us are three-fold. First of all because we have a lot of facilities, energy is a big expense for us and energy costs are going up. So, we want to save energy wherever we can. It actually makes a big impact on our bottom line in terms of operating expenses. But secondly I personally treat TD as a living laboratory and by looking at energy reduction within our company we can understand some of the new technologies which we can actually roll out into financial products. Thirdly our customers and our employees expect us to lead in this area. We put all of our North American data into it, both US and Canadian so we are using it for all of our data. This absolutely feeds into the level of complexity that we need for our analyses quite apart from the fact that we are a North American bank and need both US and Canadian data. Across that footprint we recognize that there are factors such as weather - other types of factors that can greatly impact our energy use. So, it is important for us to have a depth of complexity in the analysis that makes it meaningful. We can’t work on averages. We need the numbers, we need them yearly if not more frequently and we need to be sure they are correct. Comparative energy analysis, often called benchmarking, is an English term that is used a lot in French as well. So, this analysis is one of the modern tools available to us that help us carry out building renovation projects. So if you’re using ENERGY STAR Portfolio Manager or if you are using other tools like the REALPAC tool, you have many, many options of how to collect the data, but if you’re using a benchmarking tool you also have options of how you compare yourselves to others. So there is added value in using a national tool that allows you to compare while you’re also tracking and monitoring your energy use. If you look at just one building, when you look at it, you form a picture of this building at a given time, it just tells us that at that moment the building consumes a certain amount of energy. The real way to go about it is to give that building a time-based reference, taken over a longer period of time, but also to benchmark it against a similar building in a basically similar context in another city, or wherever, to be able to see the comparables. The BOMA BEST program provides certification for buildings that have implemented energy efficiency upgrades and environmental upgrades, too, in terms of recycling, indoor air quality management, etc. in the building. The BOMA BEST refers to ENERGY STAR data and gives the owner the opportunity to see all that can be done to the building to improve it. So there is a very useful link there – one shows you the need for improvement, the other gives you the means. That energy, in order to be used, when you say you have a building that consumes $2 a square foot, and another that consumes $4 a square foot, it means that you could probably power a whole other building with the waste from this one. The reason we’re very excited about the new ENERGY STAR as it applies to Canada is that we’re working off of a Canadian reference right now as opposed to a modelled American one. And that means that we have Canadian weather, which is different from much of the States, and we also have the references that are based on a survey that was done in Canada. So we’re very excited to have that context and very excited to have that specificity as it applies to ENERGY STAR. The bottom line? Portfolio Manager can power a reliable, numbers-based roadmap to energy savings. It can inform your energy efficiency goals, give you true comparative data based on the Canadian environmental reality, and help create a solid business case for energy improvements or retrofits. Flexible, robust, and best of all, built to reflect the reality of running buildings in our climate, ENERGY STAR Portfolio Manager is available now, and it’s absolutely free. I think there’s five wins in this scenario. The environment gets better, the utility companies use less energy, the contractors get more work because of the retrofits, the end users end up with a less costly building, and the owner ends up with a better building that he can lease or sell so everybody, everyone benefits all down the line. Increase your asset value, fine-tune your control and management, and build to a better bottom line. 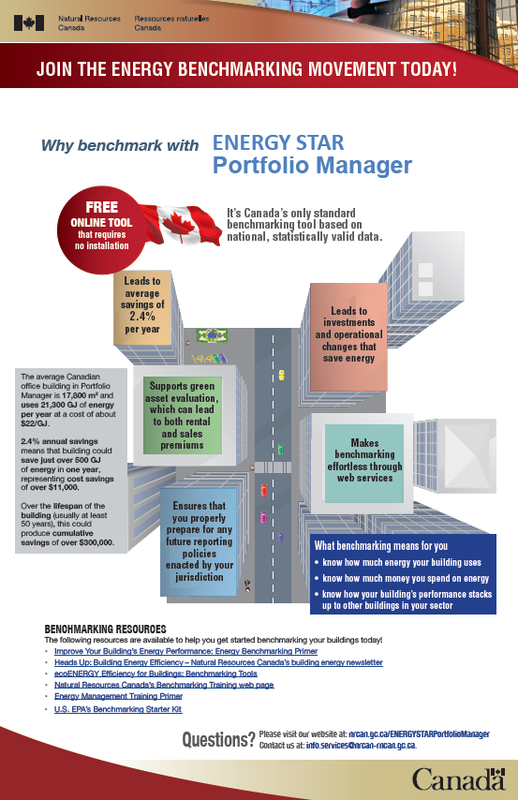 Join the thousands of Canadian buildings using ENERGY STAR Portfolio Manager. Find out more today. Safety and security is an important and ongoing process for both Natural Resources Canada and the U.S. Environmental Protection Agency (EPA). During the migration process to upload Canadian data to the upgraded tool, all Canadian data was separated from U.S. data and stored on a secure EPA server located in the U.S. All Canadian data is now under the governance of the Government of Canada. The Canadian federal Access to Information Act and Privacy Act now apply to all Canadian-sourced Portfolio Manager information and to all records under the control of the Canadian federal government. In addition, due to the fact that the data is located in the U.S., it will also be subject to multiple U.S. security measures. For more information, see our Security and Privacy Notice below. For questions, e-mail info.services@nrcan-rncan.gc.ca or call 1-877-360-5500. Portfolio Manager is the industry standard for benchmarking commercial building energy efficiency, with more than 260,000 buildings benchmarked as of the end of 2012. It was launched by the U.S. Environmental Protection Agency, as part of its ENERGY STAR program, in 1999. In September 2011, the U.S. Environmental Protection Agency and Natural Resources Canada entered into an agreement to expand features available to Canadian Portfolio Manager users. The tool went live in the summer of 2013, giving Canadian users the ability to seamlessly use all functions of Portfolio Manager, as well as all web services to exchange data electronically with the tool. Secure, Password Protected Access – Upon registration, you establish your own account name and password. No information within your registered account will be examined without your express written or verbal permission. Secure Communications – All building data and messages communicated over the web are secured by Secure Socket Layer (SSL) encryption to protect data transmissions. No information is transferred openly over the web. For site security purposes and to ensure that this service remains available to all users, Portfolio Manager employs commercial software programs to monitor network traffic to identify unauthorized attempts to upload or change information, or otherwise cause damage. Portfolio Manager utilizes "session" cookies. "Session" cookies are used to distinguish one user from another as they navigate through a tool or application; the cookie disappears when a web user terminates a web session and closes the browser. They are not used to save personal information. Where identifying information is collected in Portfolio Manager (such as your name, contact information, building and energy meter data, etc. ), it is only used for the stated purpose of the tool or system you are using, such as participating in a building competition, applying for certification, etc. In all cases, such information is never sold to third parties, and we do not track or record information about individuals and their visits. Information collected may be used for the purpose of identifying industry trends, evaluating the reach and impact of Portfolio Manager, or to gauge general usage statistics for the betterment of the site as a whole. Except for authorized law enforcement investigations, no other attempts are made to identify individual users or their usage habits. Raw data logs are used for no other purposes and are scheduled for regular destruction in accordance with U.S. National Archives and Records Administration guidelines. For Canadian users, the retention and disposal of records created in Portfolio Manager is governed by the Canadian federal Library and Archives of Canada Act. Information provided by Canadian users within the U.S. Environmental Protection Agency’s ENERGY STAR Portfolio Manager website is subject to protection by the U.S. Federal Information Security Management Act. Personally identifiable information that is entered into Portfolio Manager that is collected by Natural Resources Canada is done under the authority of sections 21 to 24 of the Energy Efficiency Act, is not shared with third parties, and is subject to the Canadian federal Privacy Act and the Access to Information Act. If you have any questions or comments about the information presented here, please send your comments to Natural Resources Canada by e-mail at info.services@nrcan-rncan.gc.ca or by phone at 1-877-360-5500. You can also contact the ENERGY STAR buildings help desk for more information.